There are watches that define luxury, brilliance, passion and the incredible skill of designers and watchmakers. The unique design and craftsmanship are the combination that lures the buyer and the collector to purchase such a distinctive item. The price is clearly no object when it comes to owning one of these impressive timepieces. 10. The Chopard Super Ice Cube. Price $1.1 million USD. This exquisite timepiece is a luxury item. 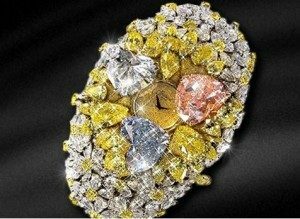 The Swiss designed the 60 karat diamond watches to be breathtaking. The 18 karat white diamonds on the face, sides and the dial of the watch is a remarkable achievement. The bracelet of the watch is completely made of diamonds. They made the watch scratch water resistant for a depth of 50 meters. 9. The Vacheron Constantin Tour ÌIle. Price $1.5 million USD. The 18 karat rose gold coloured watch has a silent second hand that sweeps across its doubled face. The watch features an additional time zone, the time when the sun sets and a continuous calendar. The watch has eight hundred and thirty four pieces and a year had passed before the design was completed. Near the edge of the back snap-on case is lined with Sapphire crystals. The Sapphire glass comes equipped with its own anti-reflective coating that protects the face of the watch. 8. 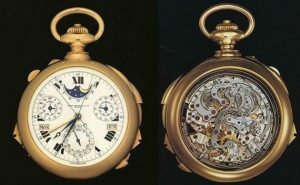 The Fibonacci Pocket Watch…Price $2.4 million USD. This is a stunning pocket watch for the ladies. 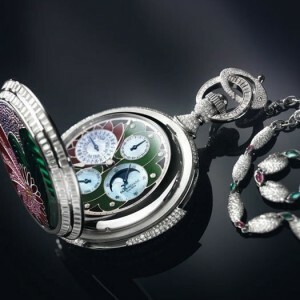 This watch has over 2,300 diamonds, 12 Emeralds, 14 Rubies and a blue precious stone. The decorative etched Lotus Flower design is on the top of the cover and the inside of the lid. The watch has Cathedral sounding chimes that strike every hour. The platinum chain is adorned with Emeralds and Rubies. 7. 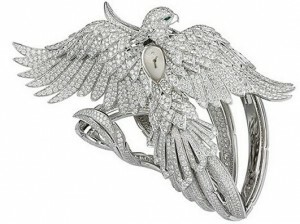 The Cartier Secret Watch with the Phoenix Decor. Price $ 2.7 million USD. The Mythical Phoenix has never looked so grand or had a hefty price tag. The 3,000 dazzling diamonds are expertly laid in a perfect die cut of the Phoenix bird. Emeralds were used to accentuate the eyes. This diamond studded watch is made with 18 karat white gold with a rhodium plated base. This is a gift for the very feminine girly-girl. 6. The Piaget Emperador Temple. Price $3.3 million USD. This is an elegant and extravagant timepiece that any woman would love to wear on her wrist. When the top of the jeweled temple has been reached there is a small watch in the center. The case is adorned with 688 baguette cut diamonds. 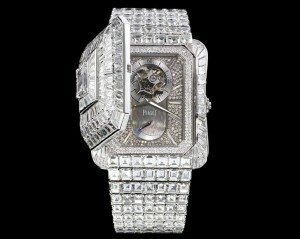 The second face of the watch is sparkling with 173 diamonds and the bracelet is covered with 350 diamonds. When the watch is closed, it can be worn as a bracelet. The truth is that diamonds are a girl’s best friend. 5. 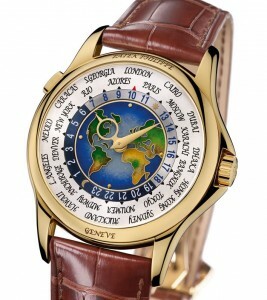 Patek Philippe’s Platinum World Time. Price $4 million USD. This is an Alpha male’s watch. This handsome 18-karat gold watch is available in rose, white gold or platinum. This self winding timepiece allows the wearer to check 24 different time zones. 4. 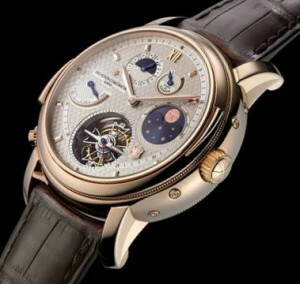 The Louis Moinet Meteoris Watch. Price $4.5 million USD. Astrologers and people who are fascinated with owning a piece of the outer world’s will be ecstatic to own this timepiece. This watch was made with pieces of the moon, an asteroid and a Mars meteorite. Talk about out of this world. 3. Patek Caliber 89. Price $5 million USD. 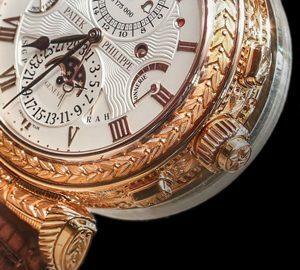 This stunning pocket watch is 18 karat gold with 33 complications. This intricate mechanism was constructed with 1,728 components and took two years to make. This pocket watch weighs in at two pounds. 2. 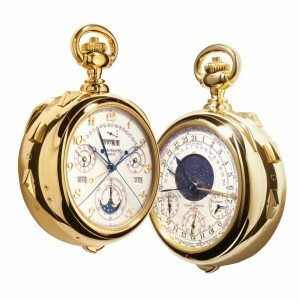 Patek Philippe Supercomplication Pocket Watches. Price $ 11 million USD. This was a custom design for an American banker named Henry Graves. The 18 karat gold watch was designed in the Classic style. There are nine hundred parts that were made for this timepiece. It was assembled and completed in five years. 1. Chopard 210 karat. Price $26 million USD. This masterpiece is so expensive, that there is no listing price. With its 201 karats of coloured diamonds, the watch looks more like a bracelet. It is a spectacular piece of jewellery first and a timepiece second. This watch is beautiful and simple time piece that looks like it is surrounded by flowers.